Gov. David Umahi of Ebonyi on Saturday vowed to discharge his duties with the fear of God, if elected for a second tenure. 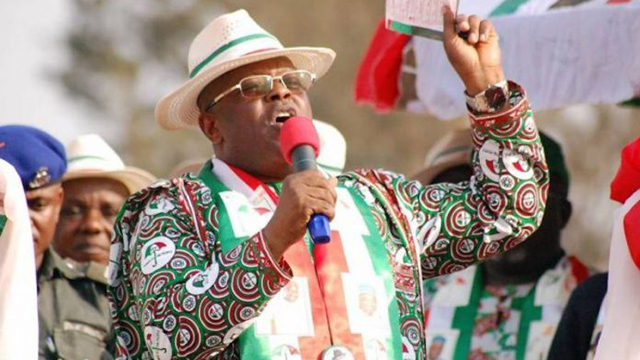 Umahi made the vow during the grand-finale of the Peoples Democratic Party’s (PDP) campaign rally, held at Uburu Secondary School in Ohaozara Local Government Area. The governor commended the clergymen and members of the state chapter of the Christian Association of Nigeria, for their commitment and prayers for peaceful campaign rallies in the state.He said: “In your presence, we pledge that we will always work with the fear of the Lord, who has given us victory for a second chance. “And, on behalf of the PDP candidates in the state, we pledge that we will always put God first in all we do. Umahi also applauded the South-East Vice-chairman of the party, Mr Austin Umahi, for his hard work in making the rallies in the zone a huge success. He further paid tribute to the traditional rulers for giving their support and blessings to the party during the campaigns in the state.He also thanked the state party Chairman, Mr Oyekachi Nwaebonyi, the Director-General, Divine Mandate Campaign Organization, Mr Fidelis Nwankwo, for their relentless effort in ensuring peaceful rallies across the 13 local government areas of the state. They encouraged the people to replicate similar support at the polls in order “to sustain good governance in the state.”“I commend all of yoy, who made the rallies a success. We started with God and ended successfully,” Egwu said.News Agency of Nigeria (NAN) reports that various speakers at the rally took turns to educate the people on how to cast their votes and the election procedure.